What is the Corporate Video Production Process? The corporate video production process can be daunting and confusing if you’re not familiar with it. You’ll be committing valuable budget resources to the project so getting it right is critical. Your production agency should offer guidance, help and resources along the way and work alongside you at each stage of the process. As a rough blueprint for producing a medium sized corporate video we’ve sketched out the following process roadmap to help you through the journey and to give you a way of adding accountability to your supplier. This is one of the most important parts of the corporate video production process. Most projects start life as face to face meetings. Your producer should visit your company to not only chat through your ideas for the film but also to get a feel for you as a company and a brand. Understanding our clients target or viewer and getting under the skin of what makes their customers tick is one of the most important factors in producing the best films for them. Even when we are supplied with a multi page detailed brief we find it very useful to document exactly how and what we will produce for the client. Therefore after briefing your production company you should expect a detailed response before green lighting the project. This “brief response” obviously includes a fully detailed quote but should also breakdown the following – key messages, production process (so you know what will happen and when), shooting days required, style and tone of the film, and also some description of the footage and dialogue to be produced. You may feel like this is essentially duplicating your original brief a little but its an important factor in establishing that the production company has clearly grasped your requirements. Again, as a client you may wish to develop the script yourself but remember that the producer has a great deal of skill in planning what dialogue and shots will work the best so involving them in the scripting is a wise move. Unless your spending movie sized budgets don’t expect a hand illustrated story board such as the ones you see on movie behind the scenes short films. The cost of illustrating a storyboard like this can be several times the budget for the entire project and is really something that only happens in the world of cinema. 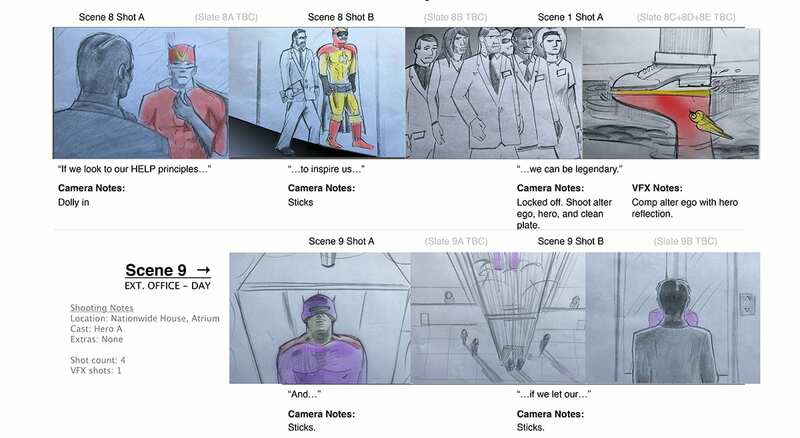 using stock images to create a rough story board is an option but bear in mind that the images are a guide of angles and action as the final footage will very rarely look like what is produced. A much better approach is to review some of your production companies other work and indicate the type of shots and presentation that you do like and the sort that you’d like to avoid. Once the shooting style is clear your producer should supply you with a detailed shot list and shot description which is a much better tool at this stage to help visualize the final film. Within the pre-production period your production company should also generate a filming schedule. Ideally it will break down each day into hours so that you know what they intend to film and in what order. Any filming permits, clearances and risk assessments should also be carried out by the production company at this stage. Prior to the first day of filming you should receive a “call sheet” which is a document detailing every important element of the day. It will include all crew/cast names and contact details, timings for location arrival and setup, and other important details such as travel notes (location maps) and location first aid notes. You may need to cast models/actors, voice over artists or even your own staff to feature in your film so casting should be confirmed well in advance of filming. If your casting models/actors or voice over artists your production company should either supply you with a shortlist (don’t let them send you 000’s – they should provide the first cut based on your brief) so that you can choose the right look/voice for your films. Additionally don’t accept just one option (this happens a lot with voiceovers) finding the right tone for you film is key and you want anyone featured to have a look or voice that your customers can identify with. If you are planning to feature your staff in the film then we suggest doing a very rough screen test with anyone you think will be good on screen. When filming commences if you plan on attending the shooting ask your production company to provide you with a monitor. This is essentially a screen the relays the main camera feed so that you can see exactly what is being shot. This is the best time to check or amend anything that you aren’t sure about and can save you money and time by avoiding costly re-shoots or lengthy editing. Getting the shots right on set is THE most important part of production, there is no substitute for capturing great material and no amount of special effects and editing skills can compensate for this. Post-Production: Editing, Animation, Voiceover etc. As a client you may request that you are present for the editing or you may prefer to let your producer/editor get on with the task. If you do want to sit in on the edit we suggest allowing some time before you do for the editor to assemble and manage all the material and complete a basic draft edit. There’s a lot of technical and footage management in the initial stages of an edit and sitting in on this part is of no benefit to anyone. Once the initial edit is completed you should expect to receive an approval/feedback copy along with any notes the director/editor may want to flag up. Depending on your production company this may be supplied as a downloadable file or they may host it online (with a password so only you can view it) on sites such as vimeo. After viewing the draft you can expect to feedback your thoughts, request changes and additions etc. It’s important at the quoting stage to ask your production company how much time they have factored into the quote for this edit revision/approval process. They should have a clear process and cost for getting you to your final edited master and leaving this open ended is a mistake. Not knowing how many versions/changes you can ask for within the original quote can make the working relationship between editor and client tricky so clarify this from the outset. Once you have agreed the final edit of the film your editor should then apply a final sound mix and tweak any of the shot colors so that the whole film has a cohesive look and sound. The final part of the production process is to deliver the masters in whatever format you require. For corporate films we would expect to deliver a HD file version that you can download onto your system as well as compressed versions for online, youtube and device (iPad, smart phone) use. So that’s pretty much it, a good overview of the corporate video production process. Remember every project differs so some of the parts of this process wont be relevant for all projects but hopefully it provides a blueprint for an easier process next time you commission a corporate video.